ITEM #MBCLASSNIB: NIB and FEED UNIT FOR MONTBLANC CLASSIC. Available in Fine & Medium/Fine (right on the boundary). 18K. New Old Stock. ITEM #MB VERMCAP: VERMEIL CAP SHELL FOR MONTBLANC 144 FOUNTAIN PEN. No dents or dings. Note: This item does not include a clip, snow cap, or inner cap. ITEM #144 SOCKET: A DESK BASE SOCKET AND SWIVEL FOR A MONTBLANC 144 FOUNTAIN PEN. New Old Stock. These came with 2 different lengths on the peg that goes into the desk base, .723" (18.36mm) and .618" (15.7mm). This has the LONGER. To buy please email Pentooling. Be sure and provide a shipping address so you can be given a shipping quote. International buyers please provide a phone number for shipping paper. ITEM #5562: MONTBLANC 320 FRONT END. Broad cursive italic 585 nib. No cracks in shell. A very smooth writer with just a small amount of flex. ITEM #MB BP XT: MONTBLANC BALLPOINT LENGTH EXTENDER. Allows the use of modern ballpoint refills in older Montblanc ballpoints. The newer refills are shorter, so these adapters extend the length about 1/2" so the newer refills will fit in the older pens. Fillers not included. ITEM #5531: MONTBLANC SL PENCIL ERASERS, PACK OF (5). The diameter of the end that slides into the pencil is .185" (4.7mm). Also available are erasers for Montblanc S Line pencils with a diameter of .173" (4.4mm). ITEM #MB-A NIB: NIB FOR MONTBLANC EARLY NOBLESSE. Available in Fine and XBroad, As measured on a Parker factory nib grader. 14K, marked "585". ITEM #MB-B NIB: NIB FOR MONTBLANC SL-LINE and CS-LINE NOBLESSE. Steel, marked "MONT BLANC" (on 2 lines). Available in Broad, medium Broad and XBroad (on a Parker factory nib grader). 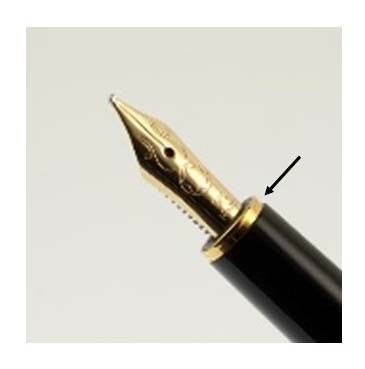 ITEM #MB-C NIB: NIB FOR MONTBLANC SLIMLINE and NOBLESSE. Broad (on a Parker factory nib grader) steel nib with image of snow cap inside a circle and "MONT BLANC" on 2 lines. ITEM #MB-D NIB: NIB FOR MONTBLANC 1st GEN NOBLESSE. Steel nibs marked "MB". Available in Medium only. ITEM #MB NIB-E: MONTBLANC NIB FOR VIP. Silver color marked "585". Available in Fine and Broad, as measured on a Parker factory nib grader. 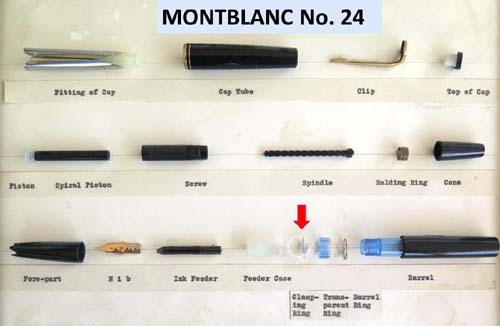 ITEM #MB-F NIB: NEW OLD STOCK MONTBLANC 24 NIBS. 14 C. Available in Fine, Medium, Broad as measured on a Parker factory nib grader. I also have a few feeds and a few collectors to go with these. ITEM #MB 344 NIB: NIB FOR MONTBLANC 344. Marked "MONT BLANC" (on 2 lines) followed by "14C montblanc 585 344"
ITEM #MB INK: NEW OLD STOCK MB INK IN CLASSIC LONG, FLAT BOTTLE. Available in Black only. Bottle in box. Snow cap on cap. ITEM #MB333 1/2: WARTIME MONTBLANC CAP for MODEL 333 1/2. 2.36" (60 mm) long, .518" (13.1 mm) outer diameter. No cracks, nice finish, nickel plated trim. ITEM #5476: MONTBLANC 221 FRONT SHELL (HOOD). New old stock shell for MB model 221. ITEM #MB X4 RING or X2 RING: CLAMPING RING FOR MONTBLANC 'X'4 SERIES PENS (14, 24, 34). 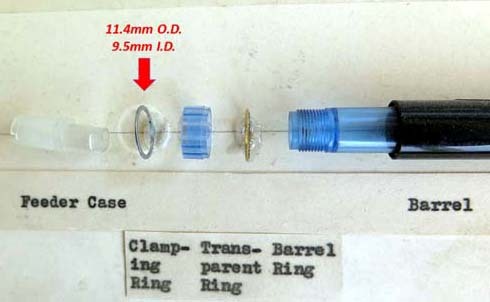 This is that tiny, thin chrome ring on the connector between the front section and the transparent ring of the series of pens whose two digit model #s end in '4' that always gets lost without your knowing it. It rolls away and you didn't even hear it drop. And you're not going to find it no matter how much you crawl around on the floor looking for it. Its dimensions are: od = 11.36mm, id = 9.6mm, and thickness = .37mm. We also have these for the No. 22 + the '2' series. Request the MB 22 Section Ring for that size. Its dimensions are: od = 10.7mm, id = 9.0mm, and thickness = .38mm. ITEM #MB144 RING: REPLACEMENT FRONT BAND FOR MONTBLANC 144 FOUNTAIN PEN. This is a part that is often found corroded on the oringinal pen. Bring your damaged 144 back to daily use. Gold plated to match the 144 trim. ITEM #OBLIGE RING: FRONT RING FOR MB NOBLESSE OBLIGE. These have upon occasion corroded and become messy, requiring a replacement. These fit onto the front of the Noblesse Oblige. (Note that these will not fit on the Classique, as the outer diameter is too small). The ones below with the red ends have a diameter on the end of 0.207" to 0.240". 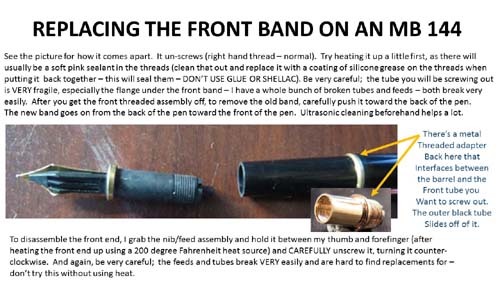 Those with the black ends have a diameter on the end of 0.288" to 0.294". The tan colored adapter below will fit on the red mechanism so it is the size of the black mechnism. ITEM #MB 165 PNCL: MONTBLANC 165 .7mm PENCIL MECHANISM. This mechanism fits inside the eraser cover shown in the lower photo on the right that goes inside of the cap and has the clip fastened to it using a snow cap. This part is not included. ITEM #252 CLIP: MONTBLANC 252 CLIP ONLY. ITEM #227 CAP: COMPLETE GOLD PLATED CAP FOR MONTBLANC 227. No dents, dings, or damage. ITEM #MB GEN NIB: NIB FOR MONTBLANC GENERATION. Has snow cap in circle logo followed by "585" and "14ct. Medium on a Parker factory nib grader. ITEM #146 SOCKET: A DESK BASE SOCKET AND SWIVEL FOR A MONTBLANC 146 FOUNTAIN PEN. New Old Stock. These came with 2 different lengths on the peg that goes into the desk base, .723" (18.36mm) and .618" (15.7mm). This has the shorter. ITEM #GENERATION CAP: GREEN CAP FOR MONTBLANC GENERATION. Gold plated trim. Complete cap.